Our healthy eating diet advice helps make healthy kids and mommies yummy! Sign up for our free healthy eating coaching plan to learn easy ways lose weight and improve your family's health all without special "diet" meals or preparing separate meals for the kids. Simply fill out your name and email address in this form, hit the "Sign Up Now!" button, then confirm your subscription in your email inbox. Once you've confirmed you'll receive your bonuses. 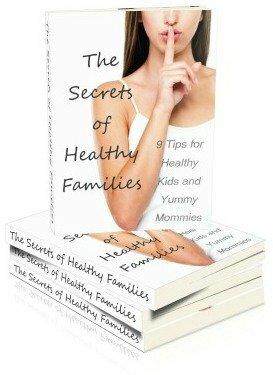 For a limited time when you sign up for our healthy eating advice you'll receive our free special report "The Secrets of Healthy Families: 9 Tips for Healthy Kids and Yummy Mommies". In it we'll give you the 9 secrets that can change your family's health, energy levels, and bodies! As a special bonus we'll follow it up with 10 weeks of coaching (absolutely free) to make sure you can implement the secrets for a healthier, happier family! Healthy eating diet advice and coaching has been shown to help participants lose almost twice as much weight as those not getting coaching services! Sign up now to start your healthy life today! If for any reason you're not satisfied with our healthy eating diet advice and coaching emails you can easily unsubscribe at any time by simply clicking the link at the bottom of every email and we will never email you again. We're so confident that you'll find value in our coaching that you get to keep "The 9 Secrets of Healthy Families" even if you decide to unsubscribe! We think we've got a darn good free service going here, if you think so too please forward this to a friend by email or social media like Facebook!